Relax while you listen to the birds singing outside this spacious traditional-style country villa with pool! 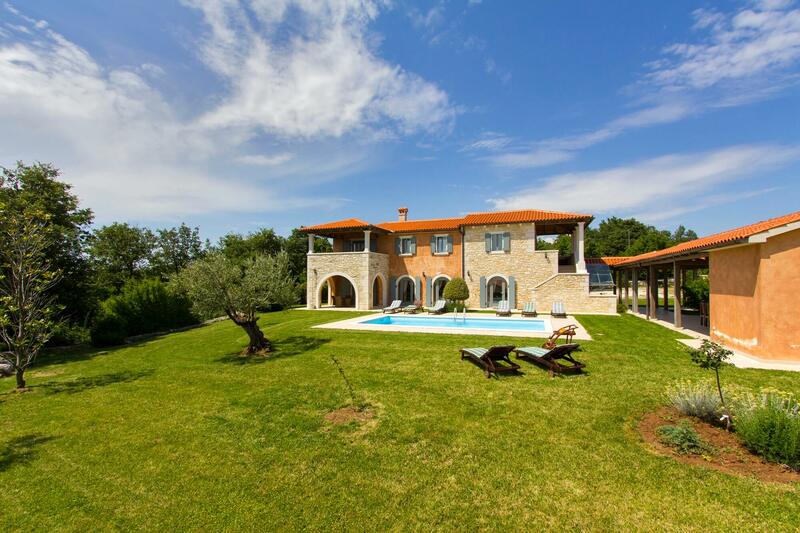 Located in Pifari, Žminj, sunlight floods through the windows and doors at Villa Gimino and olive trees dot the large property and garden. Four bedrooms, all with en suite bathrooms, can accommodate up to 10 guests; the master bedroom has a private covered veranda. A spacious living room, kitchen, dining area, and additional bathrooms are on the ground floor, while air conditioning can be found throughout the house. Soak in the Mediterranean sun in one of the many chaise lounge chairs or float in the private heated swimming pool. Children and adults alike will take pleasure in the game room, which includes table tennis, foosball, and darts. Once your day’s excursions are over, come together for dinners in the large dining room or outside in the covered terrace, complete with barbecue and fireplace. Beautiful spots for walks, bike riding, and trekking are in vicinity of Villa Gimino and with a short drive you can take in museums, historical sites, and aquariums. Also nearby, horseback riding and golf provide additional opportunities to admire the breathtaking landscape. Istria is known for fresh seafood, asparagus, truffles, olive oil, and fantastic local wine-be sure to make these culinary treats part of your Villa Gimino experience! sehr schön, sehr zu empfehlen. sehr nette verwaltung. top. Wir waren eine Woche in der Villa Gimino, die Villa war sehr sauber und der Pool/Garten toll. Im absperrbaren Grundstück gibt es sogar auf der hinteren Seite des Hauses die Möglichkeit innerhalb des Grundstück mehrere Autos zu parken. Excellent property for exploring Northern Croatia. Nicely decorated inside, good facilities, plenty of space for my family of 6, however it can sleep 8 people easily. Has a BBQ area, good swimming pool with sun loungers. The property owner Toni was very helpful. Many villages and attractions within 40-60 minutes drive. The house was comfortable and the seven of us enjoyed staying there immensely. Weather was perfect and we had a great time exploring Istria for the week. Wunderschönes Ferienhaus mit Pool und Garten.Wir verbrachten 2 Wochen mit unserer Hündin hier.Sehr ruhig und friedlich gelegen.Gute Konobas in der Nähe und innerhalb von 20 min. erreicht man Meer und alle Städte -gut gelegen zu relaxen aber auch tägliche Ausflüge zu unternehmen.Wir würden es weiterempfehlen und nochmals hierherkommen.